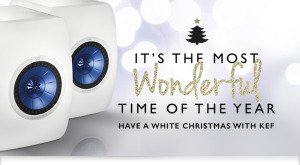 Happy Holidays from Busch Home Theater and Kef. Check out the LS50 in the new Piano Gloss White Finish. Great sound with a stunning new look! Previous PostLINN Products-Record players-DS and DSM network music players-Speakers “Simply the best”Next PostKEF Ci200RR/Ci3160RL-THX Ultra2 Certified speakers within the home theater room via 7.1-4 DOLBY ATMOS spec.